We stayed three nights at this property and couldn't have been happier with our choice. The home is located in a medieval village which was great for exploring. As no cars are allowed in the village we parked down the hill which was under a 10 minute walk to the apartment. We were greeted by Nathalie who was extremely helpful and very friendly. She also lives in the village so was available if we had any issues. The photos posted for this property do not give the view justice! We would definitely rent this home again for our stay in the area. El departamento está realmente en medio de un caserío medieval, en la roca cavada y a 200 metros del castillo de Roquebrune! Para acceder hay que hacer 300 metros desde el parking más cercano. Es un triplex básico, con una habitación y baño en la primera planta, dos habitaciones y un baño en la segunda y una cocina en el tercer nivel, con una vista increíble al mediterráneo. Todo el resto ok, sin ningún problema. Si no tenés problemas con las escaleras, es una opción distinta e interesante. 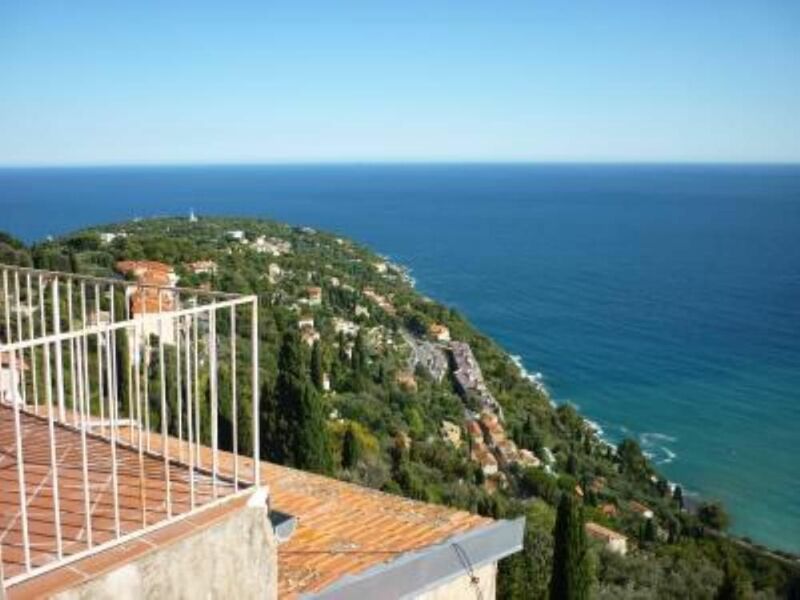 "We spent 4 days here in winter (January) and the weather was fantastic, the view across the sea and to Monaco amazing, the home is a 3-4 level appartment in a medieval village with no car access once in the main village, free parking is available just on the edge of town. Initial access is a bit difficult - walking with suitcases and climbing a few stairs, but with cases on wheels, not that hard. You do need some sort of transport as there are no shops/supermarkets in the village. There are a couple of restaurants and a cafe in the village, and a couple of art shops. There are lots of stairs in the appartment, so not recommended for people with knee problems or very young children! We stayed with our kids aged 8, 13 and 16, and they loved the place and were quite safe on stairs etc. The kitchen/lounge and balcony are all on the top floor, with everything you need, and a magnificent outlook. Food shops, many restaurants and the sea are about 10 minutes away by car, (Cap Martin). The nearby towns are lovely, it''s worth walking around the Cap Martin coast walk, and visiting Menton. The apartment is charming, and we really enjoyed out stay." "Beautiful village,nice accomodation,access not easy"
"We stayed for one week in the end of June 2011 and there was a festival/party in the old village of Roquebrune, but still the noise level wasn't too high during the nights. The view from the terrace was just magnificent and surroundings were safe and idyllic. The apartment tidy and all the necessary equipment was there. We were travelling with a 6-month-old child and the village and the house had quite a lot of stairs, but we knew it beforehand. There was no grocery nearby, which is unfortunate. The owner was really nice and she offered to drive us to the railway station when we were leaving :)"
"The house is beautiful, magnificent view to the sea. The village is charming and it has a castle:) Just what i was hoping for."